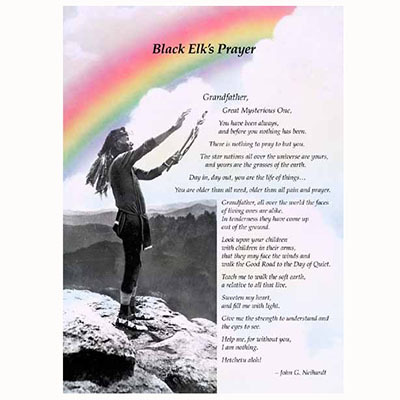 This fine series of five art prints created by Neihardt Publishing from the original charcoal artwork by Cherokee Artist, Kaaren Amaro, is titled “The Horses of the Great Vision” and was taken from Black Elk’s great vision chronicled by John Neihardt in his book, Black Elk Speaks. The charcoal originals are 26 inches by 19 inches and the art print reproductions are 10 by 8 inches and ready for matting and framing. If you have a large wall, get the whole set and arrange them as shown in the layout of the notecards. Many people with less wall space purchase the note cards and mat and frame them to arrange all five in a smaller space. 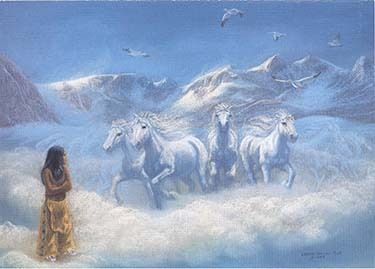 The art work is an artist’s realization of the Spirit Horses of the South, West, North and East. 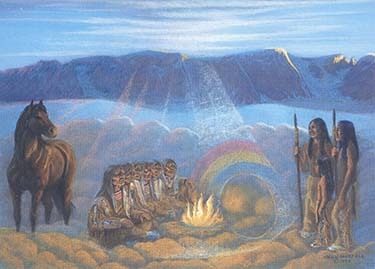 The fifth print portrays the 6 Grandfathers in the cloud tepee of the Spirit World and the spirit guides that led Black Elk, as a young boy, to them.
. . . and as we walked, there was a heaped up cloud ahead that changed into a tipi, and a rainbow was the open door of it; and through the door I saw six old men sitting in a row. 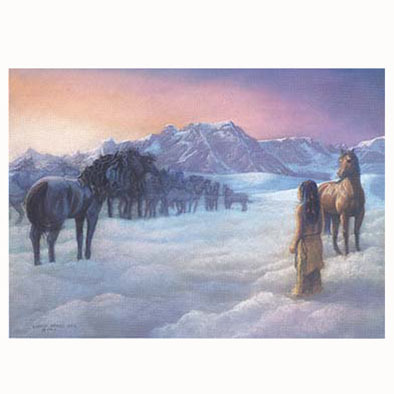 The two men with the spears now stood beside me, on on either hand, and the horses took their places in their quarters, looking inward, four by four. 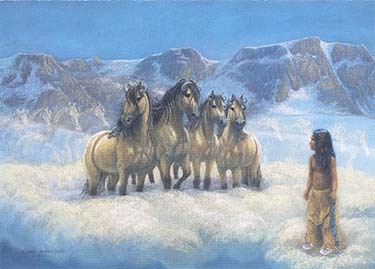 And the oldest of the Grandfathers spoke with a kind voice and said: “Come right in and do not fear.” And as he spoke, all the horses of the four quarters neighed to cheer me. 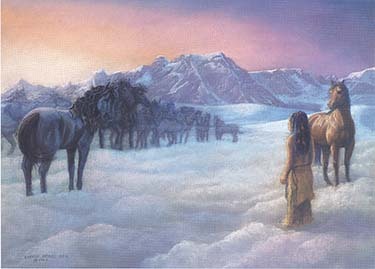 so I went in and stood before the six, and they looked older than men can ever be – old like hills, like stars. 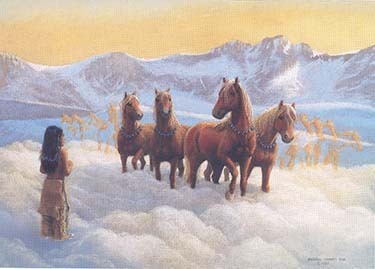 The oldest spoke again: “Your Grandfathers all over the world are having a council, and they have called you here to teach you.” His voice was very kind, but I shook all over with fear now, for I knew that these were not old men, but the powers of the world.